Four years ago Sue was taking her daughter to a shopping centre just a few miles from where they live in Berkshire. As she slowed down at a roundabout, where the light was at red, a truck driven by a 19-year old using his mobile phone ploughed into the back of her car. "The back of the car was a mess and my daughter was OK but the impact gave me a huge jolt and I ended up with really bad whiplash," she explains. Whiplash is an injury that affects the neck and that is usually mild and short lived. 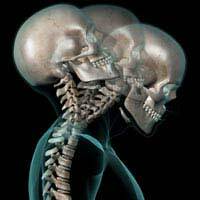 Being hit from behind when in a car is the most typical way that people sustain whiplash. This type of injury accounts for around three quarters of all car accident insurance claims in the UK – the figures for 2007 show that nearly half a million people claimed on their insurance after getting a whiplash injury. The exact mechanism that causes whiplash is not understood in great detail but the sudden throwing forward of the head, followed by a sudden backward movement shocks the spine and can damage the anterior longitudinal ligament. Some people feel pain in their neck and shoulders, with perhaps tingling sensations down the arm very soon after the accident, but others feel OK physically but then develop symptoms a few days later. An ambulance was called and Sue and her daughter were checked out at the local hospital before being allowed home later that day. "My daughter was 12 at the time, so she was much lower down in the seat, so her neck was more protected. My headrest was tilted back so it didn’t support my head at all – I had been meaning to get it fixed..." says Sue. As a precaution, Sue was given a neck collar to wear for 36 hours and, despite being shaken and shocked by the accident, she felt OK. "It was four days after the accident that I felt like I had cricked my neck, but much worse. I then got pins and needles in my right arm and hand and pain in my shoulders. My GP explained that this was common for whiplash and these feelings would wear off in less than a week. He advised that I take ibuprofen and keep mobile and the practice nurse gave me some gentle exercises to do, which did seem to help," she remembers. Over the next week, the cricked neck sensation wore off but Sue started to develop a headache each day. "I would feel OK first thing in the morning – I had bought an orthopaedic pillow, which really helped me sleep better. It was during the day as I went to work – at the supermarket, I did shifts on the tills and it is quite hard on the shoulders and by the time I got home at 3.30pm, just before Louise came in from school, my shoulders were aching and my head was pounding. I usually ended up lying down on the sofa and Louise made us microwave dinners. I felt like an invalid," she says. After visiting her GP again, he said that it was likely that Sue had sustained a more serious whiplash than had first been diagnosed. He arranged for her to have a course of physiotherapy, and booked her out of work for two weeks to reduce the pressure on her neck that was being caused by working at the supermarket till. "The physiotherapy really helped and after it finished, I was feeling much better. When I returned to work, I spoke to the supervisor and she agreed that I would work longer hours but with more breaks. That was perfect – Louise stayed in an afterschool club until 4.30pm, I got home as she did, and I did my exercises in every break. There were days early on when I did get some pain in my shoulders and a bit of a headache but, after 3 months I had no more problems," she reports. Physically Sue is now fine and her daughter is 17 next birthday. "The one thing that I have had more problems with is the fear of being rear-ended again. It really put me off driving and I have had to make myself continue to drive us to places. Now Louise is talking about getting her provisional licence when she turns 17 and I admit the thought of teaching her terrifies me. I think she will have to learn with an instructor!" admits Sue.